It happens to taste a dish and understanding that has the flavor of a land and an ancient history. In Ancona one of these dishes is the “brodetto all’anconetana” (fish stew). Its preparation requires time and patience. The recipe is old and has not changed from its original version. In the city it is said that the fish to be used must be of 13 varieties to remind participants at the Last Supper (the recipe seems to have been invented for the Holy Week), others argue that the 13 fishes are remembering the 13 masks of the Calamo’s Fountain. Fish should be all from the sea of Ancona and ideally bought right at the harbor, around 17 of every Thursday, when the fishing boats come back from the sea. The types of fish can change depending on what is on the market and depending on your taste: you can also use red mullet, scorpionfish, testola but the important thing is that it comes from our sea! At this point the preparation. Clean all the fish, put it on a plate and season it with salt. Meanwhile, in a crock (or in an usual saucepan) put the onion, the crushed garlic and the oil (about a glass). Sauté the smells and then pour half a cup of vinegar to give a special flavor to the soup. At this point, when the vinegar has evaporated, add the parsley, the tomatoes and a few tablespoons of tomato puree that give a sharp flavour to your soup. Make sure that your basic sauce is a little liquid (if need dilute with lightly salted water), cover it and wait that it boils over low heat. When the sauce boils, add the cuttlefish and cook it for about 15 minutes. Now put on one side the cuttlefish and place the other fish. The advice is to put on the bottom the “shells” like squid and prawns, then the big fish and on top smaller fish like cod. Cook the fish which must be covered by the sauce for at least 15-20 minutes with the lid. 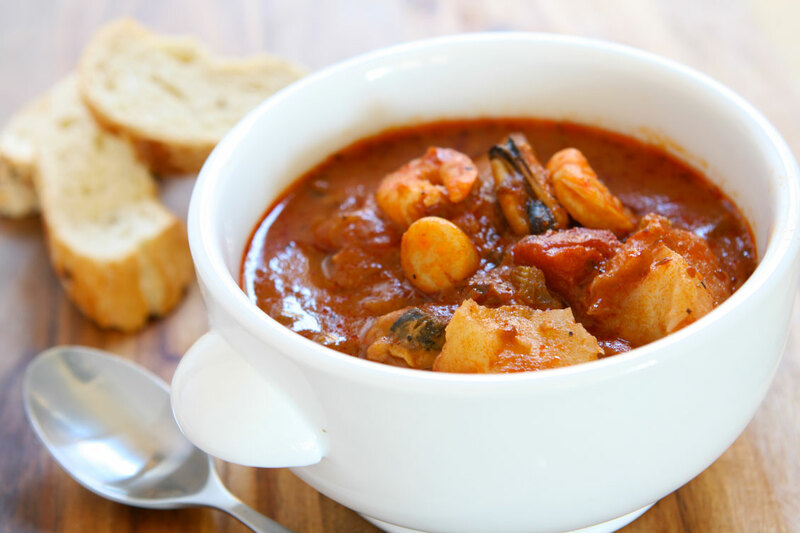 When the fish is cooked, serve your “brodetto all’anconetana” in a bowl accompanied by toasted bread and why not.. a glass of Verdicchio dei Castelli di Jesi.